The new Volkswagen Touran will be larger than the old car, yet lighter and more efficient. VW has created more space inside the car so luggage capacity is up and it can carry up to seven people. While the new Touran is larger than before it is also lighter by up to 67kgs, which is the equivalent of a small adult. That makes for less fuel consumption, which is also helped by a more aerodynamic shape. The all-new Touran is very much geared to family life. The second and third rows and the front passenger backrest can be collapsed to create a flat floor, without having to remove the seats, to create a long load through space. Ideal for trips to Ikea for that flat pack furniture then. With five seats in place there is still a really large 917 litres of boot space, which grows to 1,857 litres when both rear seat rows are folded flat. As well as a huge boot, there are up to 47 storage compartments throughout the car, depending on specification, which means plenty of cubby holes for kids to stash books, toys and Nintendo 3DS consoles. These include a “Jumbo Box” under the front armrest, compartments in the dashboard, in front of the gear lever, and in the passenger footwell. In the front there are cup holders in the centre console, large door bins and sliding drawers under the front seats. Higher spec cars are also likely to secure folding tables on the backs of the front seats. You can fit three ISOFIX seats next to each other in the second row, and there are mounts for two in the back seats, as well as optional roller blinds in the doors. Ambient lighting in the doors and footwells is standard on the top trim, and also around the optional panoramic sun roof. The luggage compartment light can be removed and used as a torch. There are five engines available from launch, all of which with have four cylinders, turbocharging, and stop/start technology. The petrol units are 1.2-, and 1.4-litre, while the diesel line-up features a 1.6-litre and two 2.0-litre powerplants (one with 148bhp and one with 187bhp). An automatic gearbox is available on all engines with the two petrol engines securing the option of a seven-speed automatic (dubbed DSG), the 1.6-litre diesel also secures a six-speed manual gearbox or the option of the seven-speed automatic. The 2-litre diesel 148bhp version comes with a six-speed manual or the option of a six-speed auto DSG gearbox, while the higher powered 187bhp version comes with the six-speed DSG auto as standard. Fitted with Bluemotion fuel-saving technology, the 108bhp, 1.6-litre diesel, has a claimed economy of 69mpg, while the 148bhp, 1.4-litre petrol, promises 52mpg. Exact specifications for the UK are yet to be confirmed though trim levels are likely to follow the existing model so expect to see SE trim badges along with Bluemotion versions that feature the most frugal running costs. 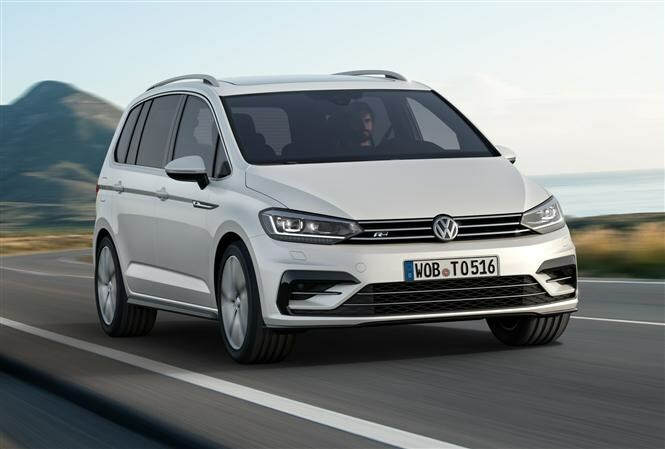 UK versions of the Touran are likely to feature a high-level of safety kit as standard including a raft of airbags, seat belt pre-tensioners plus the Touran’s second row of seats all come with Isofix points so you can fit three compatible child seats. Equipment highlights are likely to include electronic parking braking, low speed crash avoidance system, fold flat front passenger seat, ambient lighting, three zone air conditioning system, powered boot lid and adaptive front lights with automatic main beam. LED headlights now feature rather than the Xenon lamps currently fitted. VW Tourans are also likely to feature several versions of the infotainment system featuring DAB radio and touch screen controls. The higher trims are likely to be compatible with smart phones such as Apple (utilising its CarPlay) and Android with its Auto, which enables a driver to access their smart phone’s functions through the car’s controls including using voice commands. The current VW Touran had a five-star Euro NCAP rating, and this new model is 25 percent stiffer thanks to its high-strength steel, so it should secure the full five stars as well. It also features up to nine airbags. Active safety systems include and automatic post-collision braking system as standard, as well as Adaptive Cruise Control, Front Assist with City Emergency Braking (provides automatic braking in slow moving traffic when it detects stationary cars and the driver takes no action), Traffic Jam Assist, Pre-Crash proactive occupant protection, Side Assist with Rear Traffic Alert and Trailer Assist. Is it worth waiting to buy this new version? 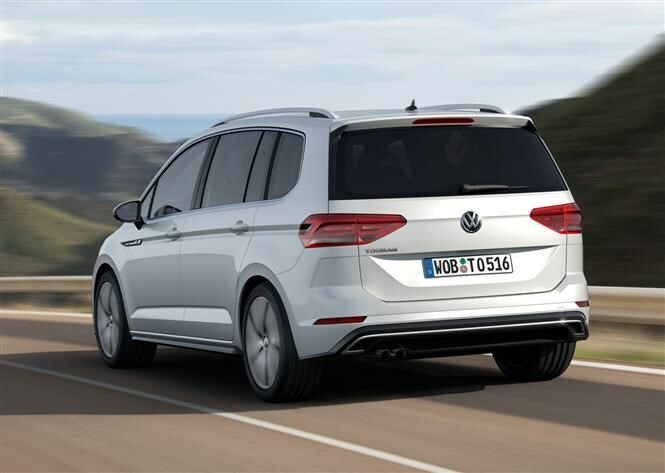 The new Volkswagen Touran is looking like a major step up from the current one in terms of offering more space for both passengers and luggage, greater practicality for families, increased safety and improved running costs. However, the equipment levels and pricing is yet to be confirmed though it is likely to be broadly similar to the current model. The order books will open in July this year, with prices and exact specifications being announced shortly before. 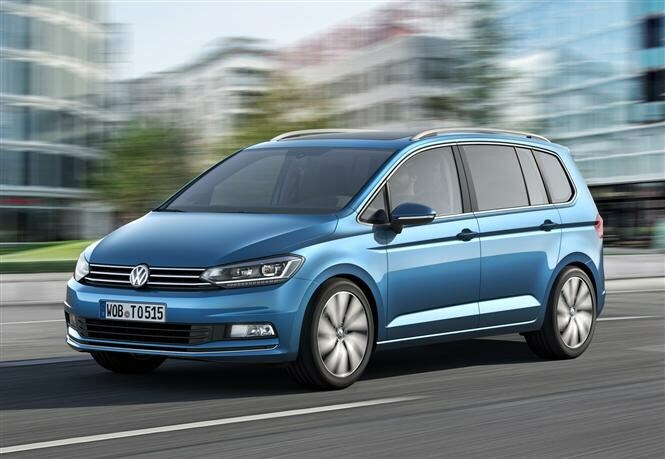 Deliveries of the new VW Touran will start in November and Parkers will be among the first to drive the new people carrier so check back soon for the full Volkswagen Touran review.